A 48-year-old woman underwent total thyroidectomy for a multinodular goiter. Histopathological examination revealed papillary thyroid carcinoma. The patient was referred to the nuclear medicine department for ablative dose of iodine-131 iodine (3.7 GBq) and post therapy radioiodine scan. Thyroglobulin level was at 11 ng/ml. Planar whole-body radioiodine scintigraphy was performed in the anterior and posterior projections 5 days after the ablative dose of 131I. Single-photon emission computed tomography (SPECT-CT) was additionally performed for anatomical localization of the thoracic radioiodine-avid foci. The whole-body radioiodine scan revealed cervical radioiodine uptake, in relation to a post-surgical residue. The scan also showed two quasi-symmetrical thoracic radioiodine-avid foci located probably outside the pulmonary fields (Figure 1). 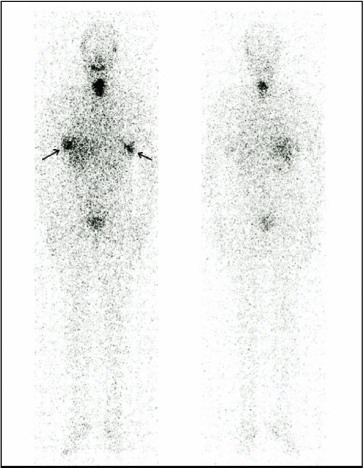 On the SPECT-CT scan these thoracic foci of radioiodine uptake were seen to correspond to uptake in both breasts (Figure 2). Whole-body scintigraphy after 131I ablation showed unusual bilateral focal uptake in the breasts in a patient with papillary thyroid carcinoma. This appears to be a rare case of false-positive uptake in a non lactating woman. The knowledge of the usual sites of radioiodine concentration in the body is essential for the correct interpretation of the whole-body scintigraphy. However, the real pitfall in the correct diagnosis is concentration of 131I in a lesser known site. Physiological uptake of radioiodine can be observed in a variety of non-thyroidal tissues, breast is one of them, because of its expression of NIS; iodine accumulation in the lactating breast has been recognized for the last 64 years and is now regarded as a usual finding in postpartum patients . However, concentration of radioiodine in non-lactating breasts is rare with the first such case reported by Sitterson in 1962 . Hammami et al. studied the significance of radioiodine uptake by the non-lactating breast . Expressible galactorrhoea and moderately elevated prolactin levels were observed in 48% and 24% of cases, respectively. Other rare causes of breast radioiodine uptake have been described, which include breast fibroadenoma  and breast carcinoma . Honour AJ, Myant NB, Rowlands EN. 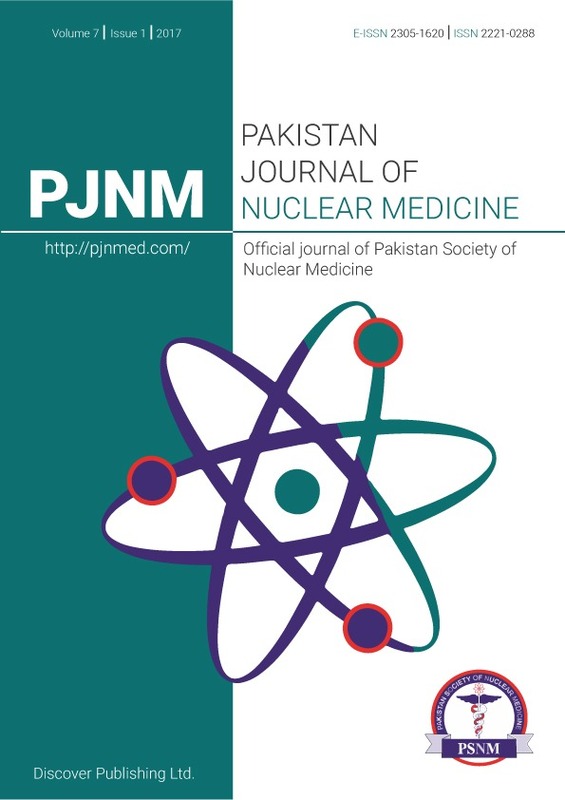 Secretion of radioiodine in digestive juices and milk in man. Clin Sci 1952; 11: 449–62. Sitterson BW, Andrews GA. Introduction to thyroid scanning: introduction to thyroid scanning. Progress in medical radioisotope scanning. Oak Ridge 1962; 279–295. Hammami MM, and Bakheet S. Radioiodine breast uptake in nonbreastfeeding women: clinical and scintigraphic characteristics. J Nucl Med 1996; 37:26–31. Berger F, Unterholzner S, Diebold J, Knesewitsch P, Hahn K, Spitzweg C. Mammary radioiodine accumulation due to functional sodium iodide symporter expression in a benign fibroadenoma. Biochem Biophys Res Commun 2006; 349: 1258–63. Wapnir IL, Goris M, Yudd A, Dohan O, Adelman D, Nowels K, et al. The Na+/Isymporter mediates iodide uptake in breast cancer metastases and can be selectively down-regulated in the thyroid. Clin Cancer Res 2004; 10: 4294–302.